I read about this the other day and this is the first chance I have had to share this with you all. (I apologize if someone has already written about her). Kobani (also known as Ayn al-Arab) is the Syrian city on the Turkish border that has been under siege at the hands of the Islamic State. The brave people defending Kobani are well aware of their fate should the city fall. Most of the defenders are Kurdish, and women traditionally serve in Kurdish defense units. 9000 Islamic State fighters are attacking Kobani with armor and artillery captured in Iraq, and they have been held at bay by about 2000 Kurds with light weapons and limited ammunition. This lightly equipped and vastly smaller force has held IS at bay for weeks. Apparently Islamic State fighters are disproportionately intimidated by women who shoot at them as they believe that being killed by a woman will prevent their entry into paradise. Arin Mirkan was one of those women. 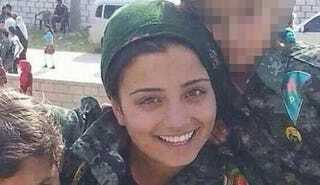 During the fighting, when she was about to be captured by Islamic State fighters as she was defending her home, rather than face capture and likely torture and death at the hands of the Islamic State, she detonated and explosive, killing herself and a number of Islamic State soldiers. Sadly this event was reported as a suicide bombing in the western media, which is a gross distortion that casts her actions in a negative light as far as I am concerned. Arin was not a suicide bomber. She was a soldier who died defending her home, friends, family, and culture. She was rumored to have killed 23 of the enemy who are doing their best to destroy her people. Arin Mirkan was a hero. In the battle for Kobani, Syria, Kurdish women warriors are said to terrify ISIS.